Since we started sharing our preschool alphabet book a few days ago with uppercase A, it seemed only fitting that we go ahead and share the lowercase version as well. 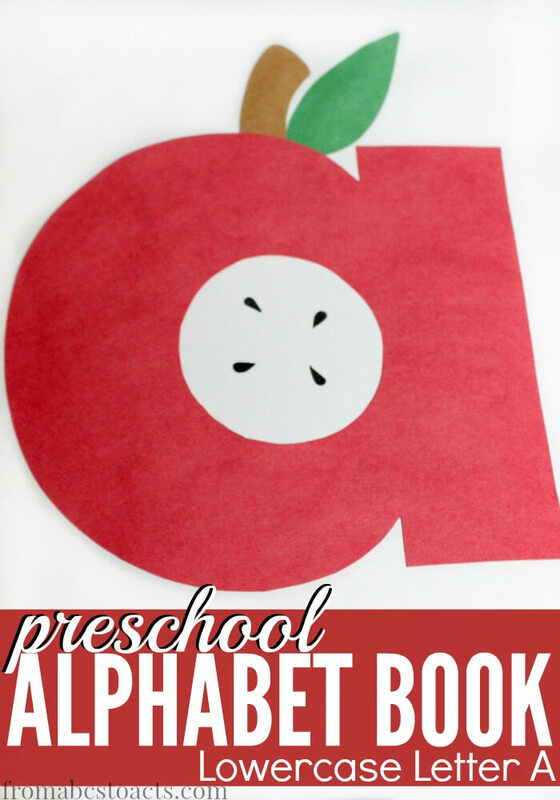 And since one of the first things that comes to mind when thinking of the first letter of the alphabet is an apple, that seemed like the perfect letter craft for us to make. This is such an easy lowercase letter craft to make and you probably already have everything you need to make it! To get started, cut out a lowercase letter a from your red construction paper. If your children are old enough, have them cut the letter out themselves although they may need some help with the inner circle. To make this easier, print out a lowercase letter A that you can then use to trace onto your construction paper. Once your A is cut out, glue it down onto your card stock. This gives your craft a sturdier backing and allows you to put it into to your alphabet book. Cut out a few apple seeds from your black construction paper and have your child glue them down directly onto the card stock right in the middle of your letter A. Finally, using your green and brown papers, cut a stem and a leaf and finish off your apple by gluing them onto your card stock. For our lowercase letter page, just like our uppercase page, we broke it into three parts. In the top box you’ll find a Dot the Lowercase a’s section. We used our trusty Do-A-Dot markers to complete this but you could also circle them or draw other shapes around them. The middle section is again, a handwriting section that gives your little one a chance to practice printing lowercase letter A’s and the final section includes CVC words that include the short a sound with a space for your preschooler to trace the vowel. Just hole punch your pages, add them to your alphabet book and watch it grow!